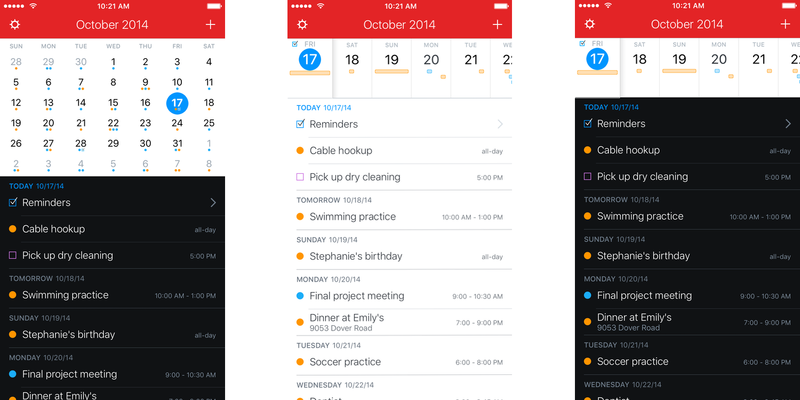 Have you ever wondered what the best calendar app for the iPhone was? Calendar apps for iPhone are a tough thing to advise for because different people use them in different ways. Some people are busier than others (meeting wise), and others use their calendar as a to-do system (personally I question your sanity if you are this way). All of the primary calendar apps I tried are great but might not fit how you use a calendar app. There is a lot to like about Apple’s default calendar app for iPhone. It shows the date icon on the home screen (something no other app can do without using a notification badge). When I’m using this app, I stay in the “List View” so I can scroll my upcoming events. I don’t have a lot of events on my calendar (I tried to avoid meetings like the plague). I do like to be able to get a quick glance at my week to know what I have coming up. It’s heavily integrated with the rest of Apple’s platform. Apple’s app does a lot of things well. 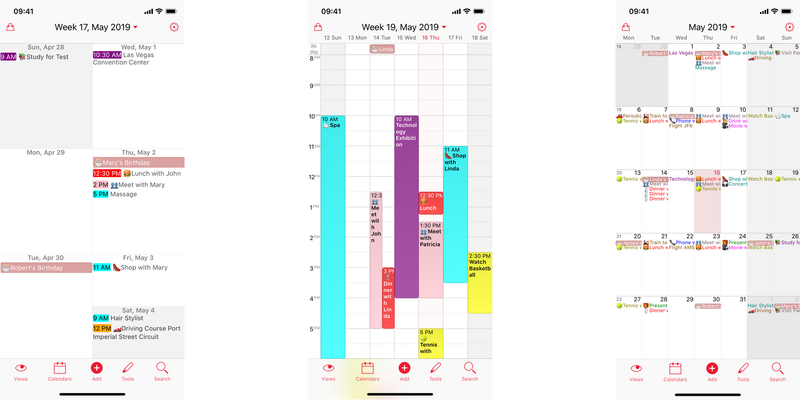 It integrates all of your calendars into a single app, provides timely travel time information (pulling the data from Apple Maps traffic data), and is easy to use. Where it could improve is in its “time to enter an appointment.” While it has added things like auto-complete, it really should add better natural language input for quick entry. For many apps now, that is a standard feature. If you are entering a lot of events on your iPhone, Apple’s calendar app will get tedious quickly. When I asked people for their recommendations on Twitter of their favorite calendar apps, Fantastical was mentioned by many people. That is with good reason as well. 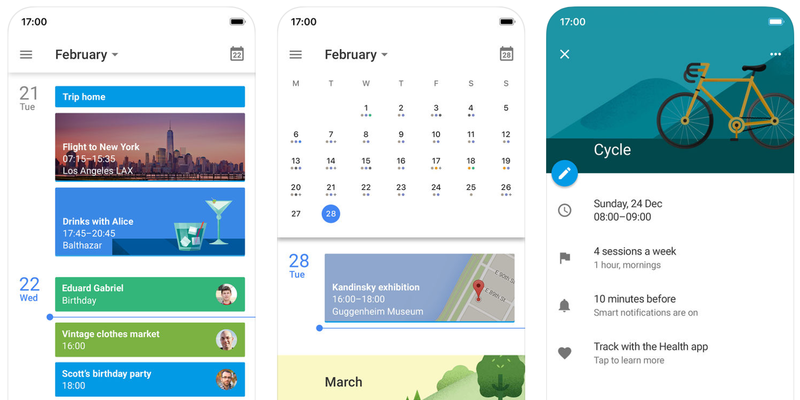 It’s long been a gold standard for third-party calendar apps. It’s the pioneer of the natural language input for calendar apps (unless I am missing an app that did it so well first). Fantastical has a lot of things going for it. It’s extremely fast to add new events using its natural language input (dinner with mom Saturday at 7:00 pm will add it). You can add in your iOS reminders, use Google Maps as your default map app (when you tap on an address), and it has a beautiful design. Fantastical also has an excellent Today widget for getting quick access to your calendar. Fantastical for iPhone is $4.99 on the App Store which includes an Apple Watch version. 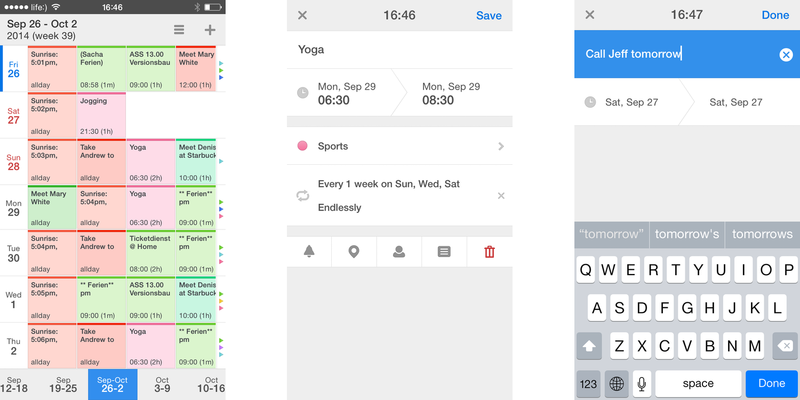 If you have a hectic schedule, Week Calendar may be an app you’ll want to check out. It includes a number of different views (week, list, month, agenda, etc.). The week view is probably the most interesting one. You can see your entire view from a single screen. You can drag and drop events to new dates/times. It lacks a natural language input, but it does have a Calendar Store. The store is an exciting add-on. You can add things like weather forecasts, famous birthdays, sports calendars, and more to your list. Adding these calendars requires a $2.99 per year in-app purchase (or $5.99 for three years). From a customization standpoint, it’s probably got the most significant feature set. You can customize the icons it uses, the default new event layout, and the various colors. If you have a lot of events on your calendar, I highly advise you checking out Week Calendar. It’s $2.99 on the App Store. Calendars 5 is from the folks at Readdle. They are the developers of some of the best iOS and macOS apps (Documents, PDF Expert, Spark, etc.). Calendars 5 reminds me a lot of Fantastical. They share a lot of similar features (natural language input, the ability to use Google Maps, and integration with Apple’s Reminders). It has a variety of views: List, Day, Week, and Month. Like I mentioned earlier, I probably prefer a list view, and Calendars 5 shows me the least amount of information compared to Apple’s app or Fantastical. Overall, it’s a great app. It’s easy to create events, has multiple viewing options, offers plenty of customization, and much more. Calendars 5 is $6.99 on the App Store. You might be wondering why I am listing the Google Calendar app on an iPhone calendar app roundup. Well, it can show more than just your Google Calendar. It defaults to it, but you can quickly add any calendar that you’ve already added to your iPhone. Google Calendars on the web has always been a first class service. The iPhone app is no different. It contains natural language input, deep integration with your Gmail/G-Suite account, and some exciting extra features (showing a haircut theme if your appointment is a haircut, etc.). There’s nothing I dislike about the app, but something about the design doesn’t sit well with me. Functionally, it all works, but it just feels like the design doesn’t fit in with the iPhone. BusyCal is probably best known for its long standing macOS app. There is also a companion app for iPhone, though! It contains a similar view to other apps (list, month, week, and day). You can create events using natural language. You can also add tags to events (could be helpful with project management). Out of all the apps I tried, it reminded me of Apple’s Calendar app the most. In fact, if it was called Calendars+, that would be an appropriate name. It includes a live ten-day weather view (helpful for planning outdoor events). Like some of the other apps, it can also integrate with Apple’s Reminders app so you can have both tasks and calendar in a single app. BusyCal was also one of the few apps I found (outside of Apple’s) that contained travel time notifications. 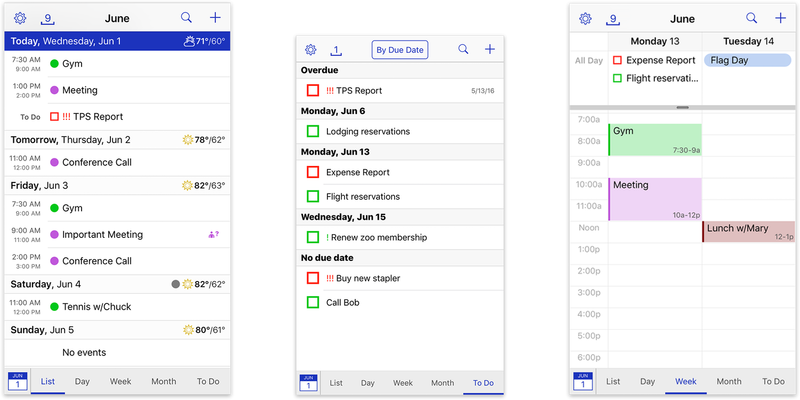 BusyCal for iPhone can be bought on the App Store for $4.99. Overall, I am torn between two apps. 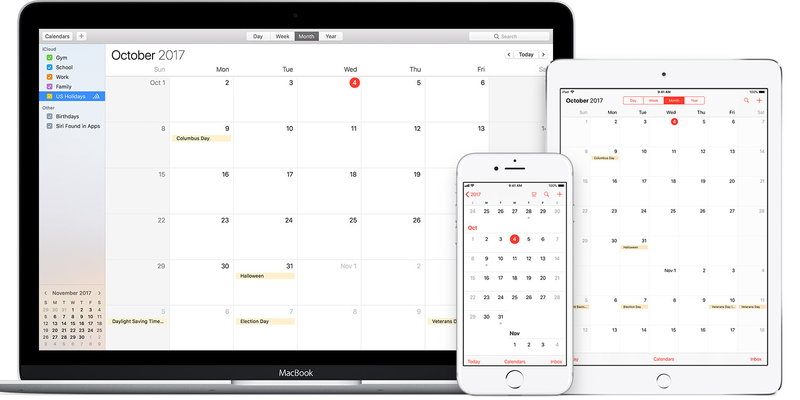 I find a lot to like with Apple’s default calendar app, but Fantastical also fits my needs. If you like Apple’s app for specific features, then you can probably stick with it. If you want something a little bit more, check out Fantastical. If you are a heavy meeting person, Week Calendar is one I’d recommend. In reality, I didn’t try one that I couldn’t easily use day to day. We are extremely fortunate to have so many great options.